In what may be a great news for Indian Air Travelers, Indian Operators may soon be able to offer WiFi on their aircrafts. According to an ET report, who have cited senior civil ministry officials stating that their ministry had approached Telecom department with a proposal in this regards and a formal announcement on the same could be made soon. Currently, only few of the international airliners like Emirates and Lufthansa offer this facility on their International Flights. None of the Indian Airliners have such a facility as it is not allowed by the Government as yet. However, this proposal is now being seriously considered, and may come to pass sooner rather than later. The unnamed DoT official has said, “The DoT has already said (informally) the proposal is possible to implement,”. If the proposal is approved, many airlines will be keen to implement this facility. 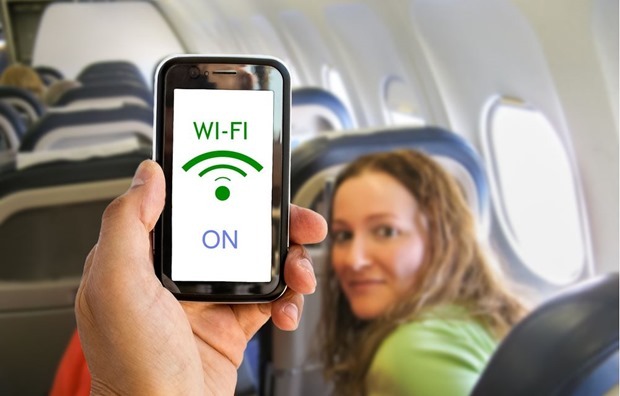 Most of the well know Airlines internationally have inflight-WiFi facility and most passengers expect this service from their Airline Operators. 1 What will be used in India? 2 Will All Indian Airliners Implement WiFi? Interestingly, there are various ways in which an airliner can provide internet to their passengers on-board. Air-To-Ground: The most popular is Air-To-Ground, which delivers peak speeds of 3.1Mbps, using cellular-based technologies. It operates on the spectrum provided by Telecom department and beams 3G signals from the ground into the sky from towers within the geographical area. The speed with this system is generally slow and internationally this system is becoming obsolete. ATG-4: This next-generation system was introduced first in the US in November 2012 and has capacity to offer 9.8Mbps speeds by using a directional antenna which more-efficiently captures the beam being sent up from the tower at ground level. Ku Band – This operates quite differently – rather than receiving signals from the ground, the internet signals are received from Satellites above through Ku band. This technology can transmit data rates at 10-30 Mbps to the aircraft. Ground to Orbit (GTO) – This is an hybrid technology which essentially is a combinational of Satellite antenna at the top of the plane to receive the signal and Air-To-Ground antenna under the plan to return the signal to the Earth. This technology can deliver speeds upto 60 Mbps. Apart from this, a new technology called 2Ku is currently in works that offer speeds in excess to 70 Mbps. What will be used in India? In all probability, either first generation Air-To-Ground or next gen ATG-4 may be used. The International Airlines that operate in India currently offer in-flight internet services to their passengers on Air-To-Ground technology for which the spectrum has been allocated by DoT. Will All Indian Airliners Implement WiFi? According to ET, Vistara and Air Asia, the two newest Airlines to start operations in India, along with Spicejet are most keen to implement on-board WiFi services. On the other hand, Aditya Ghosh, president of IndiGo said passengers cannot expect Wi-Fi on flights “in the near future”. Internet on Flights will not be free and not even cheap. Implementation of this system on flights is a costly affair and probably that is the reason, only a few of them have shown interest. Airline operators may offer this as a value added service, but Air travelers should expect steep charges for the same. It would be great if they stop treating Indians as foreigners in India. They need to speak INDIAN LANGUAGES, they are presently limited to just one language Hindi which is not original Indian language. If airlines focus making themselves more customer friendly BY SPEAKING INDIAN LANGUAGES it will be welcoming experience for flyers in general.